The Slavic Gods series was created in 1917 and published one year later. It is comprised of 15 colourful lithographs depicting Slavic deities: Svetovid, Dziedzilia, Radegast, Triglav, Dogoda, Svarog, Boha, Marzanka, Varvas, Dydek, Veles, Kupala, Lubin, Cyca, and Lelum. This ‘Polish Olympus’ made a big impression on the artist's contemporaries and brought her fame and recognition. Critics saw her as Stanisław Wyspiański's equal as she continued to creatively propagate Slavic traditions in his vein. Some considered Stryjeńska's depictions of pagan deities to be an achievement more important to Polish culture than the series of portraits of Polish kings by Baccierelli, or even by Jan Matejko. In her works, Stryjeńska introduced themes of pre-Slavic culture and the early beginnings of Polish history. During the interwar period, they became part of the national tradition. Their importance rose as Polish statehood began to be rebuilt and patriotic feelings were particularly strong after reclaiming independence. Folk and highlander art was an obvious iconographic source and a point of departure, but Stryjeńska tapped into it in only partially. Her dynamic, exuberant images differed greatly from works by other artists inspired by similar conventions. While, for example, the woodcuts by Władysław Skoczylas are very serious and monumental and Tytus Czyżewski's works provide a deep, almost mystical experience of folk art, Stryjeńska's lithographs are primarily entertaining. The main aim of their simple, genre themes is to amuse the viewer. This ludic aspect of her art satisfied the expectations of the critics of her time and of the authorities, who shared the conviction that art should be able to reach the widest possible audience. To avoid any misunderstandings, it is worth noting that the author's aim was not to recreate the characters of the Slavic deities based on scientific research. The works are her artistic concepts, partly inspired by scarce literature in Polish. Perhaps this work can bring this forgotten world into the limelight. The national style which was supposed to be developed by Polish artists of the interwar period, based on the traits and values of folk art, was one of the key issues of Polish art in Stryjeńska's time. However, the essence of folk art first had to be reformulated into the modern language of new art to accentuate the reborn country's progressive spirit. At first sight, in her work Zofia Stryjeńska mediated between contradictory postulates according to which an image was supposed to be both traditional and modern. The manner in which this compromise was formulated is best visible in the subsequent versions of Slavic Gods. 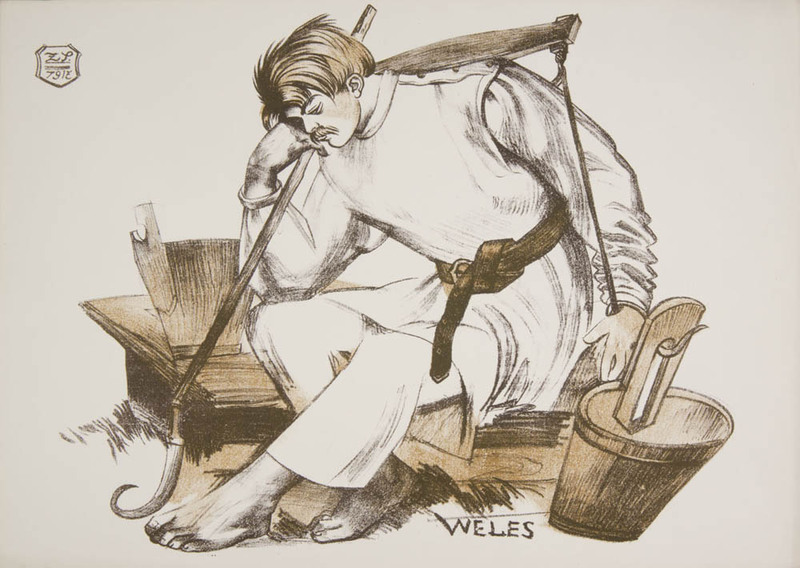 In the original 1918 version of the volume, folk themes were introduced in simple drawings, stylised to be reminiscent of folk aesthetics. Subsequent versions of the volume, especially the one from 1934, use a different plastic language. Stryjeńska deviated from the pseudo-folk primitivization and instead embraced aestheticised, fine-tuned art deco forms. These works are characteristic of the folkloric art deco style which started to develop in the mid-1920s. Stryjeńska became its head representative and spokeswoman. Her art was bluntly criticised by Tytus Czyżewski who considered her works ‘cheap folklore’ decorated with superficial borrowings from formism. However, critical voices were very rare and Stryjeńska consistently followed her artistic course. Slavic motifs were also present in her art during World War II. At that time, she was living in Kraków. She supported herself and those closest to her by painting. At the same time, she was conceptualising a Slavic temple – Vitezion – which was supposed to be a place for ‘symposiums and reunions of fellow Slavs’ and of the rebirth of Slavic spirituality. In her vision, the temple possessed a quite peculiar form, combining wooden constructions resemblant of folk architecture. In her design, Vitezion's interior resembled both a theatre and a church, with a folk-stylised statue of a Slavic deity in place of an altar. During the interwar period, Zofia Stryjeńska's art appealed to the tastes of both the intelligentsia (she was admired by Antoni Słonimski and Leon Chwistek) and the general public. The fact that she was admired by all could also be explained by her versatility. Painting was just one of the many forms of activity she undertook: Stryjeńska also designed tapestries and decorated the cruise ships Batory and Piłsudski, Fukier's winery and Wedel's sweetshop in Warsaw. She designed decorative patterns for the porcelain factory in Ćmielów, posters, postcards, adverts, and toys. Thanks to all this, she was well known not only to sophisticated art aficionados but also the mass audience thanks to, for instance, the chocolate packaging decorated with her images of Slavic deities. She was also one of the most esteemed and honoured artists of the interwar period. She realised many prestigious commissions and sold her works for huge amounts of money, exhibiting them in Poland and abroad. However, ultimately, she fell victim to her art style, which, at the beginning of the 1920s was undoubtedly fresh but half-way through the next decade it had already become cliché and was over-repeated by others – and most importantly by Stryjeńska herself – to please the mass audience. Recently, feminist theory shed new light on her art by leaving aside its artistic and formal qualities. From this point of view, her success is seen as a result of the country's political situation right after reclaiming independence, when a new style was needed to express ideological content. In this era, the authorities in their traditional form were not yet validated. This helped with manifesting changes in the old order – recognition of women's rights, including the right to vote in 1918, is one example. The figure of the ‘Polish Mother’, fixed into the mass conscience during the Partitions of Poland, was replaced by the figure of a modern, independent woman. Zofia Stryjeńska realised it not only in her art, but also in her private and professional life. Joanna Sosnowska, Poza kanonem. Sztuka polskich artystek 1880- 1939, Warsaw 2003. Katarzyna Nowakowska-Sito, Zofia Stryjeńska: 1891 Kraków - 1976 Genewa, National Museum in Warsaw, Warsaw 2009. Maria Grońska, Zofia Stryjeńska, Wrocław 1991 .